The principles of success and achievement are as old as life and as universal as sunshine. They’ve never changed throughout human history and continue to drive and guide the great leaders of our time. In fact, most of us know them already, but probably don’t know just how vital to success they really are. The setting? A workshop for business owners who want to take their business to the next level. I was co-teaching it with a colleague and one of our clients at that meeting happened to be a baker who ran a bakery. Of course, you know a bakery start’s early in the morning. Her business was growing, growing well. She decided it was time for change, she needed more help, and so she was hiring. Well, one of the people that came to interview for the job was an intern from a local business school, university here in the area. And when the owner of the bakery business said, you know we start really early, really early, like 4:30 in the morning, the job applicant said she couldn’t possibly be there that early in the morning because she didn’t get up until at least 8 o’clock, and so maybe she could get there by 9 or 9:30, perhaps 10. Because she partied at night, she wanted to go out with her friends it was impossible for her to be early. Now first of all, she’s probably in the wrong trade, because there’s no negotiating on that. But secondly, she didn’t understand, the applicant did not understand the golden rule. And that is from start to finish every minute counts because he who has the gold makes the rules. Somebody’s got the money, you want the money, they’re going to decide a lot of your schedule because they make the rules. Now, who has the gold? If you own your own company, the customers who buy your products and services. They got the gold, you want it, but they’re going to decide when you’re going to work. The company you work for is going to set your hours, they’re going to mandate your schedule. You’ve got to be here on certain days at the certain time, and that’s it, there’s no wiggle room in there because they got the gold, they make the rules. Anyone and everyone who exchanges their money for your time, talent, and effort are the gold owners and they set the rules. Successful people understand that customers decide what they want when they want it. Business owners determine when work begins and when it ends. Supervisors and managers set production schedules and stick to them and there’s a need for compliance in all of this. Customers and bosses may be paying for your time, attention and effort but you are too. Showing up on time does more than benefit your boss or your customers, it benefits you, because you demonstrate your heart is in the job. If you are unenthusiastic, if you lack a commitment to the job you’re not going to be there on time. It benefits you because you build your reputation and credibility. The boss knows, your customers know, you’re going to be there at this time to be able to handle responsibility they want to see to you in exchange for money. And most importantly successful people add value to everything they do. That’s the underlying concept behind all of this. What value are you adding to your customers life, to your company’s life, to your own life. And you’re adding value by remembering success secret #2, showing up on time. How? You add value because you show respect for yourself, your boss. And I want to focus on these last two words, your contribution. If you really believe that you have something to offer your customer, your client, your company, if you really believe that you are a valued and valuable asset you’re going to show respect for that value by showing up on time. You’re going to show consideration for others and their time. Why should you keep them waiting because you couldn’t get there on time? You’re going to show credibility because you met the requirements you set or you agreed to. You’re going to show a respect and appreciation for profitability because time really is money. That the work that you do, the product that you produce if you will, is important because somebody can bill for that, they can sell it, they can exchange it for money. You’re going to show organization of your own time. Sure you got stuff to do, sure you want to go out and have a good time, sure you have a family. But you’re going to have to organize that around all of the commitments and responsibilities that comprise a successful life. And you’re going to show that you prioritize your commitment. That when you make a commitment to be at a job at a certain time for certain length of time, you made a prioritization and you’re going to stick with it. And you’re going to show that responsibility given to you, placed upon you is well-placed. You add value to yourself by focusing on the priorities at hand and getting something done, because you’re there to get something started. If you’ve not seen lesson 1 in this series go back and take a look at it. If you’re going to finish well, you’re going to have to start well. You’re going to show that you add value to your company by being a reliable and ready to go resource. That they can look to you and you can produce something because you’re there when you said you would be. And you’re going to add value to your clients and your customers by respecting their time and your word, most importantly your word. Success is measured by what we actually do, not what we intend to do. Showing up on time is more than an intention, it’s an action. Successful people, and those who plan to be successful in life, know that the advantage goes to those who get out ahead at the beginning, that playing catch-up is never a smart strategy. And you get out ahead by being there on time. From start to finish every minute counts, including the first ones. If you’d like a little more help on this I’ve got something for you. You can go to thepracticalleader.com, that’s all one big long word, and in the upper right corner there’s a little box that says ‘free course’. Click on that and you’ll be taken to a page where you can sign up for mastering your time mini course. It doesn’t cost you a penny, nothing. It’s delivered to your email box in a series of lessons. There’s some forms that you can download that help you measure your time, that help you set priorities, that help you determine objectives in your life and it’s all free of charge just for you. And if you want a little help I encourage you to go do it. 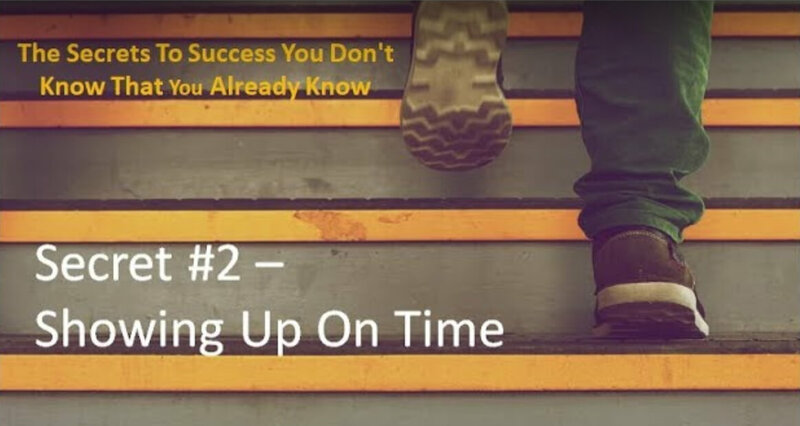 So, do yourself and everyone else a favor by paying attention to Success Secret That You Didn’t Know That You Already Know #2, Show Up On Time.